Modern Buddy : Replacement factory-style electric choke carburetter? Replacement factory-style electric choke carburetter? Posted: Wed Sep 19, 2018 8:00 pm Post subject: Replacement factory-style electric choke carburetter? I cleaned out the bowl and scaled them, I cleared the jets with a pin and cleaned the whole assembly. I loaded it with fresh gas after draining the old stuff. I replaced the spark plug but I'm wondering if the carburetter was too gone. I wanted to see about getting a replacement carburetter on there. it doesn't look exactly the same, but wondering if this could be made to work if I cut some new fuel lines to match the ports? or: is there a better place I could find the OEM one? Based on the bowl, it looks like there was only about half a bowl of crusted gas. If that's the case, then you might be able to get away with just a good cleaning, as you've done. If not, you can still bring this one back on the cheap by replacing the pilot jet, main jet, and jet holder. Those are your three big clog items. 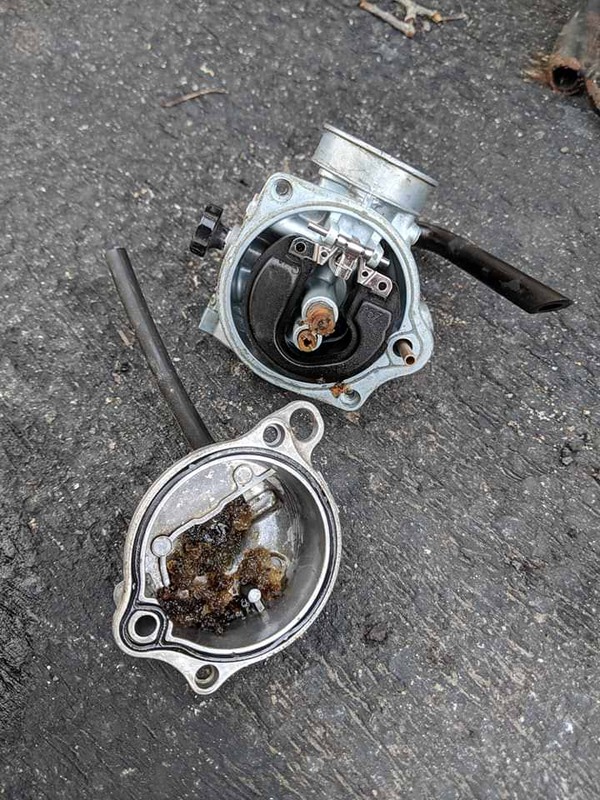 Even adding on a replacement bowl wouldn't drive the cost up to anywhere near a replacement carb. there's a lot of crap up in the orifices beyond the jets too. yeah, I was thinking if that $75 one works, it might be just as cheap as buying new jets and doing a deep clean. My wife has medical problems associated with strong odors like cleaning stuff like carb dip right now. Also, I'm not entirely sure how to get the float out of this carburetter and I know that can't go in the dip. Ok, I just went for it. got the carburetter stripped of all the rubber and plastic and dipped it. I'll check in tomorrow. I need to put a camera down the throat and make sure the reeds are ok.
Easy way to tell if your reeds are good is to place your thumb over the intake tube while cranking the engine. If you get good suction, you're fine. If there is air puffing back out at you, "Houston, we have a problem"
It would definitely be worse. A happy/healthy Roughhouse should be anywhere from 135-150psi, depending on how your rings have worn. Anything below 125 will struggle to idle, and anything below 105 will be weak sauce that barely runs, if at all.